The Scuola dell’Arte della Medaglia is a centre for the specialisation of students skilled in the art of engraving and plastic modelling and is the only one of its kind in the world. 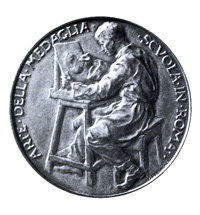 The School was founded in 1907, with the aim of preparing artist engravers, which could be engaged in the Italian Mint for the production of coins and medals. Its famous teachers - often former students of the school - contributed with their work to the transmission of a remarkable heritage of art and technique dating back to the Italian Renaissance. Faithful to its values and enjoying a growing popularity and prestige, the School continues the valuable didactic activity began by Giuseppe Romagnoli, its first Director. The School course is a post-graduate specialisation, which covers all the aspects both artistic and technological of production in a Mint, finalised in the design and production of coins and commemorative medals. The approach to the different disciplines aims at enabling the students to execute works, which, far from being mere training, combine the free artistic ideals with rigorous technical criteria. Students may therefore achieve a modern and refined creative maturity thanks to the study of ancient techniques and to the accurate development of new procedures according to the methods of a true research laboratory. Moreover the School organises conferences, workshops and cultural meetings, carries on initiatives aiming at promoting medal-making in Italy and abroad, grants scholarships and fosters the artistic maturity of its students through their participation in national and international exhibitions. The School is located in the historical buildings of the Italian Mint in Rome. A beautiful museum, a gallery of plaster casts and a library containing many historical documents are annexed to the School. A Board directs the Scuola dell’Arte della Medaglia. The Board is chaired by the Managing Director of the Istituto Poligrafico e Zecca dello Stato S.p.A. (Italian Government Printing Office and Mint) and is formed by the Director of the Mint and all the teachers of the School. To enter the School students with an artistic secondary school or art academy degree, can apply for the annual selection, which is announced by a public call. The course is triennial and no tuition fee is due. At the end of the third year, after evaluation, students receive a diploma with the final grades. Special courses for foreign students (usually engravers from Mints of other countries) are also issued. Upon request and with an admission charge, the School also admits few students to the lessons of direct cut engraving, bas-relief modelling, drawing, chasing, wax modelling, enamelling, intaglio engraving, gemstone carving. The teachers (both Italian Mint engravers and technicians, and external teachers) are chosen according to their professional experience, their artistic value and their ability in transferring the complex knowledge of their subjects to the students. The School course is set with the objective of forming artists also endowed with technical knowledge, according to the criteria of the “bottega”. In this laboratory, whose tradition dates back to the Italian Renaissance, the artist knows all the different techniques, explores them and then applies the best one according to the artistic project. In this way, the School realises a very special connection “school-factory”, which makes the School itself unique in the world. Students are frequently requested, along with the normal course work, to produce designs for external commissioners, which (if selected) are expected to be realised by the student him/herself. The high standards required (commissions often come from official bodies such as the University, the Italian Republic President, the Vatican) and the constant deadlines to be met have proved to be valid work experience. In 2007, the School celebrated its first centennial since its foundation with a special exhibition at the Vittoriano in Rome “A school of Art in the coin factory 1907 - 2007. Art Techniques Stories” and the book “Ars metallica” dedicated to the event.